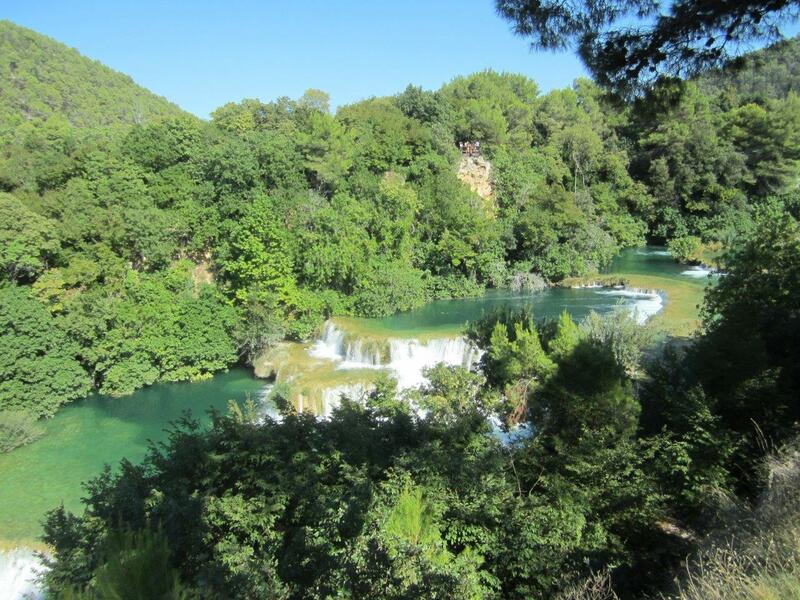 Krka National Park is not as well known as Plitvice Lakes National Park but it is more accessible from the coast and has lots to see in addition to the falls. No doubt that Plitvice is in a beautiful setting in the mountains, but if you are short on time, transportation is an issue, and/or you are on or near the coast by Split, Krka National Park might be the right choice for you, as it was for our sailing companions who had no car and only a day to explore from Split. 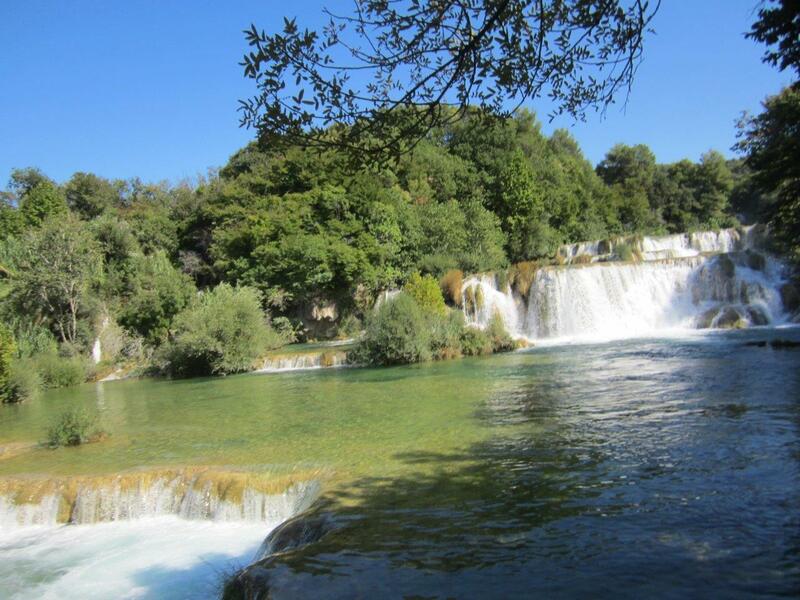 For us, we had been to Plitvice several days before Krka; nevertheless, Krka was well worth visiting. 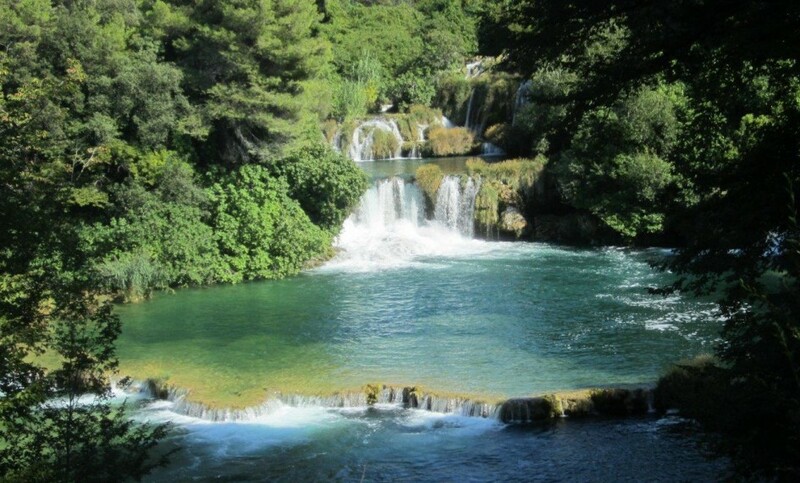 While the falls of Plitvice are more prolific than Krka National Park, Krka has some pretty spectacular falls itself and some great trails by which you can explore the falls. Plitvice is, in my opinion, a little more picturesque, but the hordes of crowds at both parks make enjoying them after 10 am a bit of a challenge. 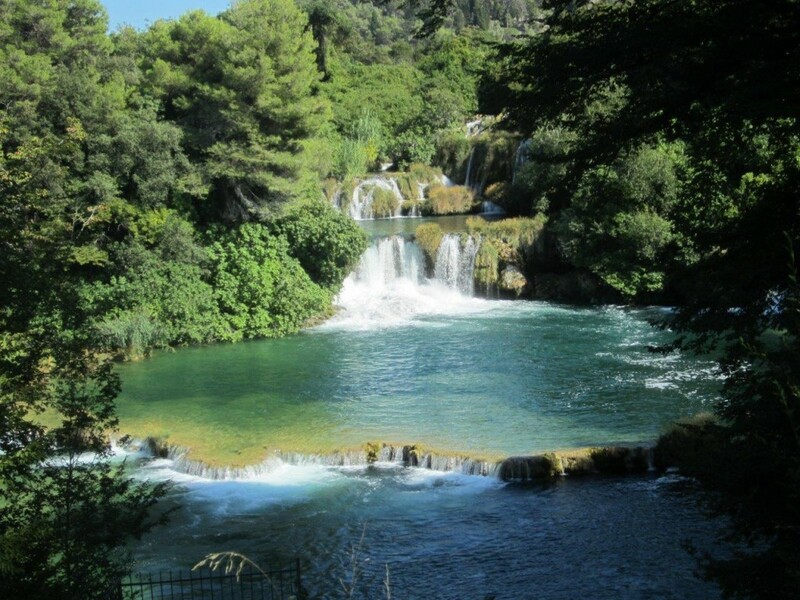 Krka has a bit more of a variety of things to do, and you can actually swim below one of the falls and get up close to them, which is a no-no at Plitvice. Skradinski buk, by the Lozovac entrance, is one place you can swim. 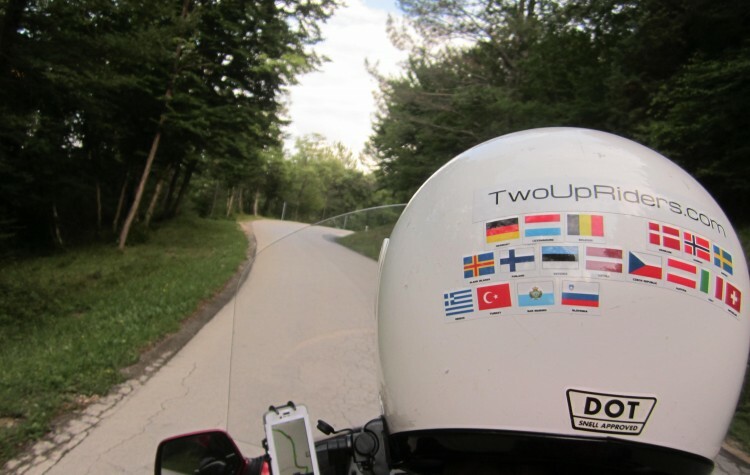 The day we visited it was really warm out and we had been riding for a while on our motorcycle direct from Plitvice. By the time we arrived at the parking area, we were almost to the point of grumpy hot. We quickly changed into our swim clothes, bought our tickets, and hopped the bus to take us down into the canyon which is several vertical hundred feet below the parking area (think the Grand Canyon on a smaller scale). After a typical dicey bus ride down a narrow road (it always amazes me the places buses can go) we reached the bus stop; we walked another couple hundred feet down a paved road. On reaching the river through tree covered pathways (walking past tchotchke shops and places to grab a snack), it looked pretty busy. Families and groups of kids swimming and playing in the river, others had walked over the foot bridge and were lying in the sun and under the birch trees. It seemed just on the border of chaos, but people were clearly enjoying themselves. We hung our stuff on a tree branch (there’s no secure place to put your belongings) and then headed out into the river. Just below the falls the current is almost nothing, but near the bridge it does pick up and makes walking on the slick rocks a challenge. We just hung out below the falls for a while to relax and cool off, taking selfies and taking photos for other people. The water was refreshing, a great temperature and surprisingly clear. 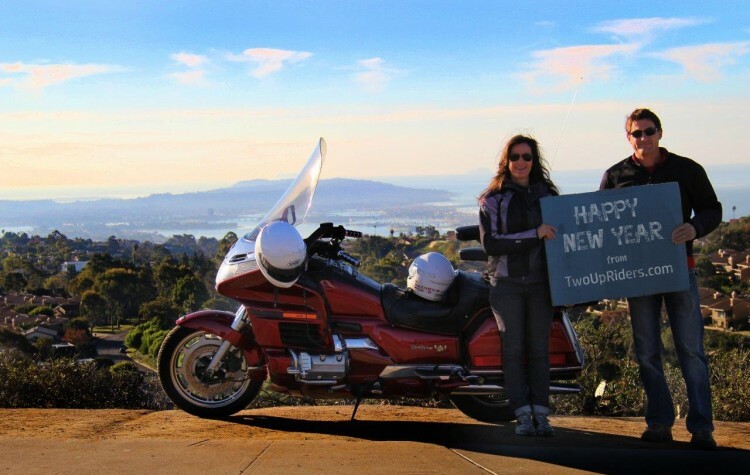 Definitely a great stop. 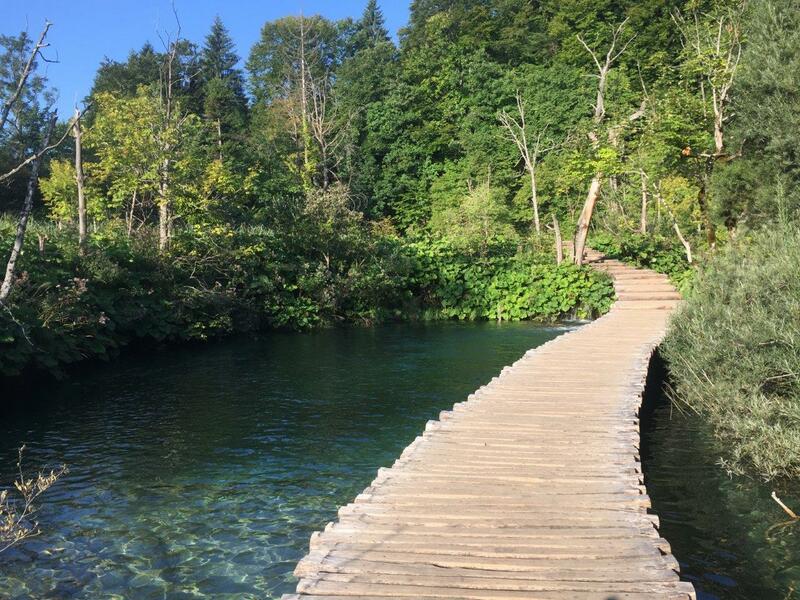 There are many hiking trails around Skradinski buk that allow you to wander through the cascades in a similar way to Plitvice Lakes National Park. 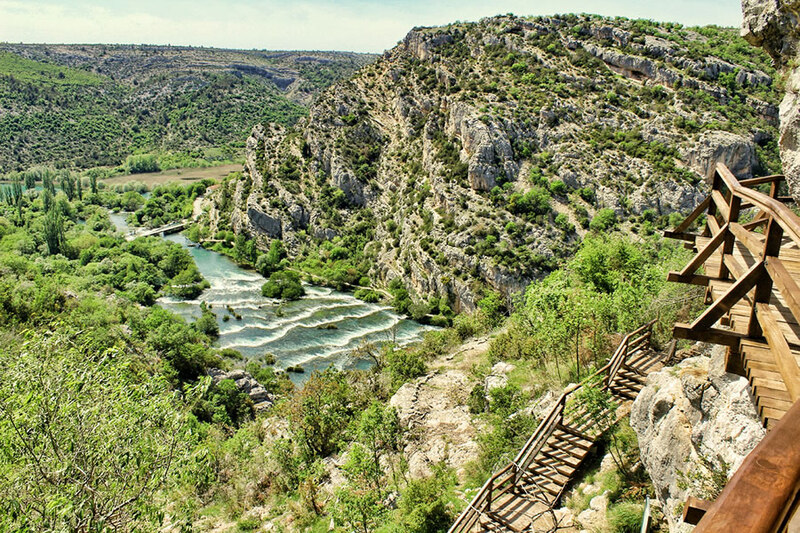 There’s also an Educational Hiking Trail that takes you 8-9 km along a path with wonderful views down onto the river around Stinice to Roški slap (slap = waterfall), and then on to Oziđana pećina to a cave. The hike takes about 2-3 hours and the elevation gain on the loop is about 600 feet. 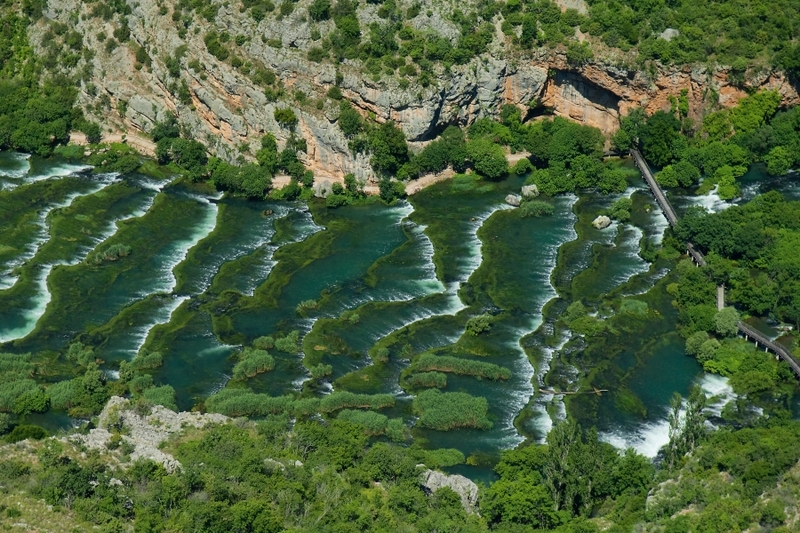 Manojlovac waterfall is the largest (at 60 meters, more than 190 feet) and some say the most beautiful of the falls on the Krka River. It’s hard to say which one is more beautiful than the other because they’re all so unique. Check them out yourself and let us know in the comments section! Several of the attractions up the river from Skradinski buk can be done on the water via a boat ride, which is a nice way to spend a day. Roški slap is a very unique stair-stepped “waterfall.” There is a large falls, but to me the smaller falls are what look pretty cool from above. Here the river is simply flowing across the limestone beds that happen to be perpendicular to the direction of the flow of the Krka River (for those geologists out there, the strike of the beds are perpendicular to flow), and it’s pretty cool to see. 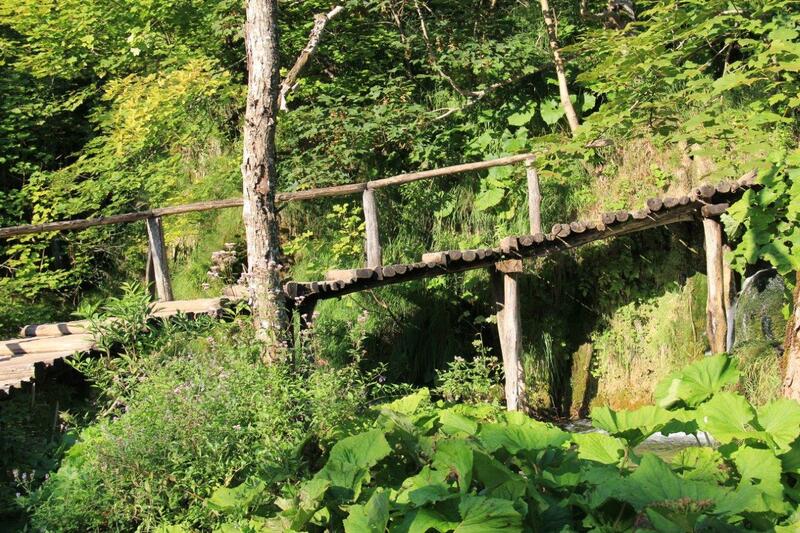 In the area there are several water mills that have been restored to working condition along with historic buildings. 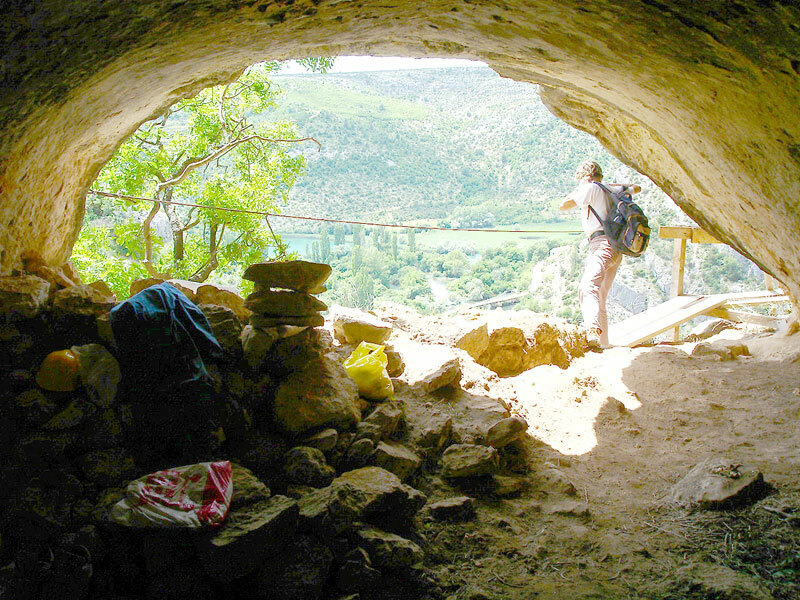 Oziđana pećina cave is a good place to visit as well while you’re in the area of the falls. It was continually inhabited from 5000 to 1500 BC and includes evidence of all of the local Neolithic cultures; that’s pretty awesome. Upstream from Roški slap on the edge of the river is the Krka Monastery, the spiritual center for the Orthodox faith. 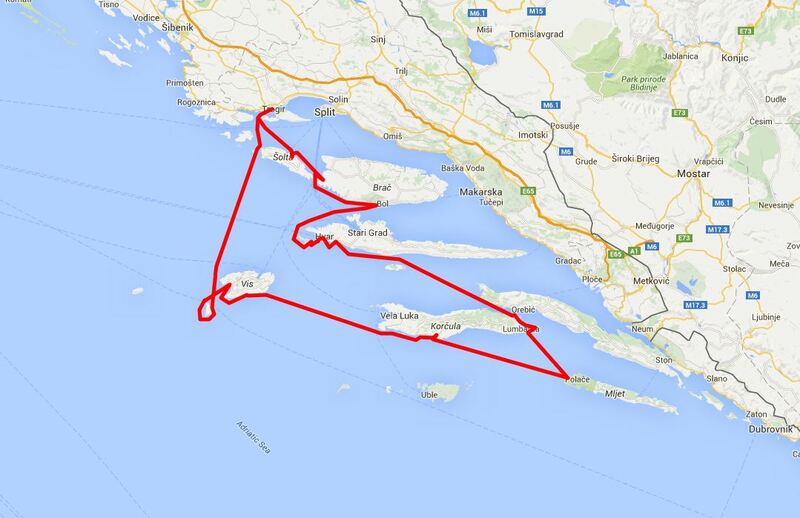 It can be reached by boat from Roški slap. Below the monastery are ancient Roman catacombs, which are open to the public. Visovac Island contains the Franciscan Monastery of Our Lady of Mercy and the Church of Our Lady of Visovac which have been in that location since 1445. 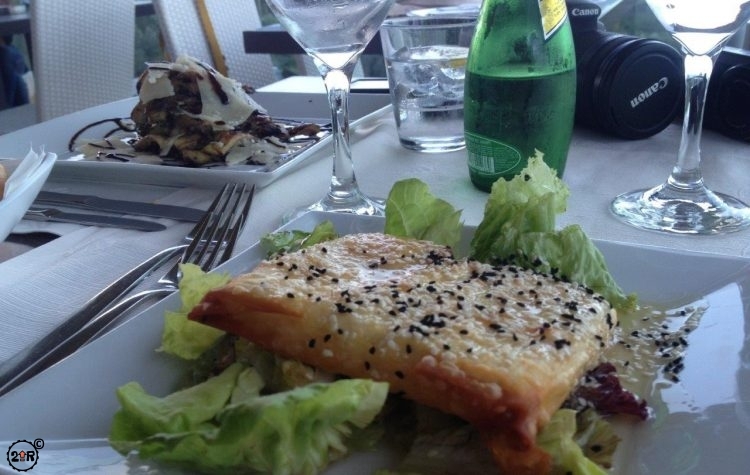 The island is surrounded by the crystal clear blue waters of the lake, filled with trout, and beyond are the majestic limestone cliffs of the valley. It’s a magical place.